CoCos is a wonderful coffee shop in Houston’s Midtown area. I love independent coffee shops, here they serve up coffee, homemade desserts, and all sorts of crepes. This was one of my favorite desserts they have served. Nutella is a wonderful creation, and you have to love in their commercials they try to sell the benefits of eating healthier because of Nutella. While I am not going to make any profession that this dish is healthy, I will tell you it is delicious, and simple. Crepe making isn’t difficult, you may have never tried making your own crepes before. You can buy them premade in many grocery stores in the refrigerated sections, but I prefer to make things homemade when you can. Making food homemade often means saving money, and knowing what is in your food. Crepes have a few simple ingredients. 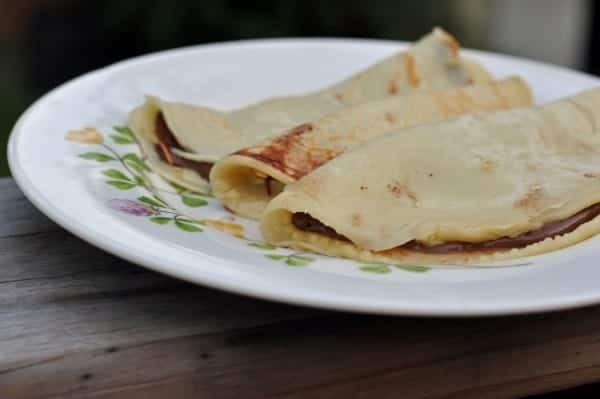 Now, the real key in making crepes is planning ahead, you mix the batter, and then you let the batter rest in the refrigerator for a couple of hours before serving. I don’t advocate purchasing a special pan to make crepes in. I use my well seasoned iron skillet, and it works wonderfully. I own a crepe pan, but I like my highly seasoned pan, because nothing sticks in my iron skillet. So I advise cooking your crepes slowly, so they don’t brown too much. Be creative with your crepes, while when I ordered these they were simply nutella in wonderfully cooked crepes, I think adding some sliced bananas, some nuts, and maybe some whipped cream would make for a wonderful dessert too! Crepes are wonderfully diverse, you can make crepes sweet or savory, the possibilities are endless. Enjoy Cocos Nutella crepes at home. Put the flour in a bowl and make a well. Add eggs to the bowl along with 1 tablespoon of vegetable oil, 1 teaspoon salt, and one-half cup of milk, blend until smooth. Add remaining milk to the batter and mix well, add vanilla, and let batter rest in the refrigerator for a couple of hours before serving. When ready to cook crepes, use a well-seasoned pan, add a little oil and pour batter into the pan, swirl the pan around to spread batter thin. Cook until the underside is golden brown and can be lifted. Cook on the other side for about a minute longer. When you remove the crepe from the pan spread a couple of teaspoons of Nutella into the crepe and fold over. You can dust crepes with a bit of powdered sugar before serving. Crepes are wonderfully diverse, you can make crepes sweet or savory, the possibilities are endless. If you feel like a splurge, we sell the most delicious hazelnut butter EVER! I was a skeptic, but as soon as we popped the top and had a taste, everyone agreed it was to die for! I just finished my first jar and am holding back from buying another because … well, it’s an indulgence on the wallet and the waistline, but the good news is that there are just 2 ingredients … hazelnuts and sugar. No erzatz anything. If you have a W-S near you, run, don’t walk and pick up a little jar of this stuff. You’ll thank for for the recommendation and the next time you make these crepes you’ll probably call CoCos and tell them they have to try it too. hahahahaha! You need to go to Europe and try the nutella crepes from the Crepe stands. My favorite late night snack was always the banana and nutella crepe. SO GOOD!